This morning, the Consumer Electronics Association (CEA) released its first annual report of the eCycling Leadership Initiative, a program that was launched one year ago to encourage nationwide electronic recycling. When the initiative was launched in 2011, the CEA and about a dozen consumer electronics companies set a goal of responsibly recycling 1 billion pounds of electronic waste — enough e-waste to fill an entire football stadium — per year by 2016. Although it still has some work to do to reach that goal, the CEA says it has made serious strides over the past year, increasing e-waste recycling by 53 percent. The CEA reports that participants in the program recycled 460 million pounds of consumer electronics last year — a 53 percent increase over the 300 million pounds of electronics that were recycled in 2010. Part of the reason for the increase is that electronics manufacturers and retailers have made it easier for consumers to recycle their old electronics. A big component of that is the website GreenerGadgets.org, which enables users to input a ZIP code and find the closest third-party certified recycler or consumer electronics dropoff location. But with gadgets getting smaller and skinnier, is weight the best way to quantify the amount of electronics that are being recycled? In a conference call this morning, Walter Alcorn from CEA said that although it isn’t perfect, it’s the standard currently used within the industry. Alcorn acknowledged that electronics companies have become willing participants in the eCycling Leadership Initiative largely to protect their own corporate image; it isn’t worth the risk for companies to hire a third-party recycling company that does a poor job and risk a PR disaster. But at the same time, there are very valuable materials in recycled electronics. “This is a significant resource management issue. The more these resources like metals can be recovered, the less they have to be mined,” Alcorn said. This morning, the Consumer Electronics Association (CEA) released its first annual report of the eCycling Leadership Initiative, a program that was launched one year ago to encourage nationwide electronic recycling. When the initiative was launched in 2011, the CEA and about a dozen consumer electronics companies set a goal of responsibly recycling 1 billion pounds of electronic waste -- enough e-waste to fill an entire football stadium -- per year by 2016. 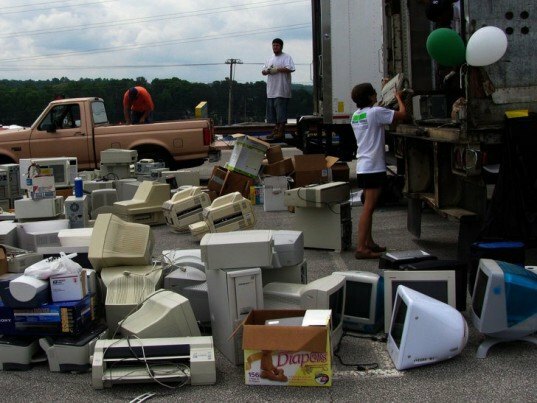 Although it still has some work to do to reach that goal, the CEA says it has made serious strides over the past year, increasing e-waste recycling by 53 percent.